It’s no surprise that debit card fraud is on the rise, but what’s noteworthy is the rate at which this figure is increasing. New data from FICO indicates the number of debit cards compromised in 2017 increased 10 percent from 2016. This figure refers to debit cards used at U.S. ATMs and merchant card readers. Compromises of ATMs and merchant devices rose 8 percent in the same time period. "The number of compromises and the number of card members impacted set a new record last year," said TJ Horan, vice president of fraud solutions at FICO. "While most devices are safe, fraudsters are developing new technology and methods for hacking ATMs. This is why it's important for consumers to be cautious when withdrawing cash, and also for them to check their account regularly and confirm that all the transactions on their debit card are legitimate." The difficulty with all types of compromised cards is the speed at which it evolves into fraud. ATM fraud, in particular, is evolving at a rapid pace. Banks are using new tools to fight fraud — machine learning, automation, cloud technology, etc. — but so are the fraudsters. The problem? The fraudsters are getting better at their jobs. The monetization of compromised cards has become a sophisticated industry. The auctioning of compromised cards across the dark web to commit and monetize card fraud occurs faster than a bank can detect a compromise, identify compromise cards, reissue the cards and call the cardholders. We address much of these issues in our report, The State of Fraud: 2017, which explores evolving threats, emerging fraud trends and how banks and credit unions can enhance their card fraud management strategies. 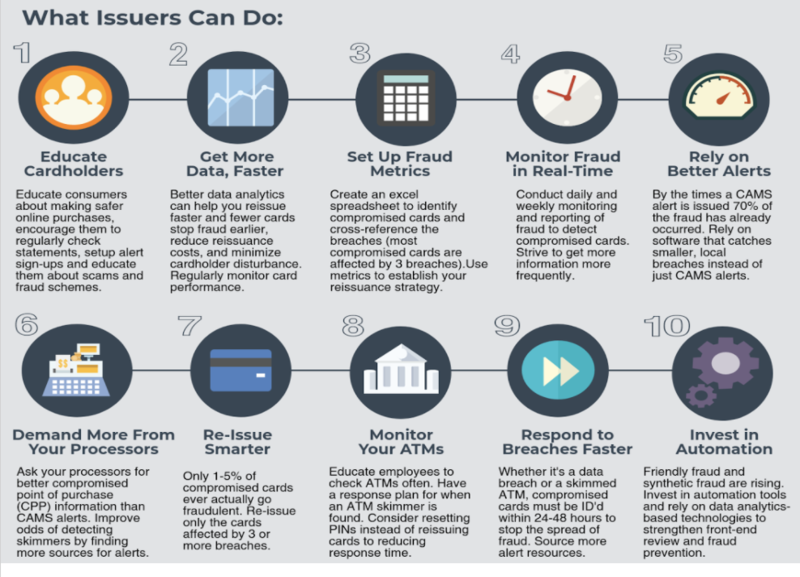 The rise in debit card and ATM fraud has forced banks and credit unions to implement better fraud controls and continually upgrade their security features in order to think smarter about their fraud management strategies. Here at Rippleshot, we've seen our fair share of debit card breaches, which is why we've gathered tips on how issuers can begin to fight this rapidly-growing problem.